The amount of food available has dropped fairly precipitously since about the year 2000. A group of academics believes the problems with increasing fuel costs and rising interest rates will be insignificant compared to looming global food shortages. Experts are discussing the growing scarcity of food and rising prices. "There's drought, there's biofuels, which is taking over a lot of agricultural land area, where we are burning millions of tonnes of grain in our cars these days, which we could be eating or feeding to animals. There is the impact of climate change and particularly we are running out of land and we are running out of water." Climate change could cause severe crop losses in South Asia and southern Africa over the next 20 years, a study in the journal Science says. The findings suggest southern Africa could lose more than 30% of its main crop, maize, by 2030. In South Asia losses of many regional staples, such as rice, millet and maize could top 10%. The effects in these two regions could be catastrophic without effective measures to adapt to climate change. 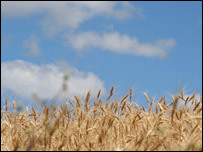 THE SCALE AND SPEED OF THE EFFECTS ON AGRICULTURE SURPRISED THE SCIENTISTS. The majority of the world's one billion poor depend on agriculture for their livelihoods. Yet it is also "the human enterprise most vulnerable to climate change". While relatively inexpensive changes, such as switching crops or altering planting seasons, could trim the losses, "the biggest benefits will likely result from more costly measures, including the development of new crop varieties and expansion of irrigation."